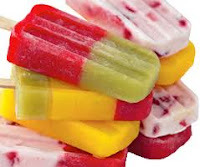 Prepare an ice pop mold according to the manufacturer’s instructions. For 2-oz. 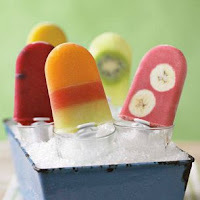 pops, place a few pieces of your desired fresh fruit along the sides of each slot, then insert the sticks. Slowly pour about 1 1/2 fl. oz. of the juice mixture into each slot, reaching just to the fill line. Tap the pop mold on the countertop to release any air bubbles. Freeze according to the manufacturer’s instructions until the mixture is solid, 7 to 20 minutes. To test, insert a toothpick near a stick.